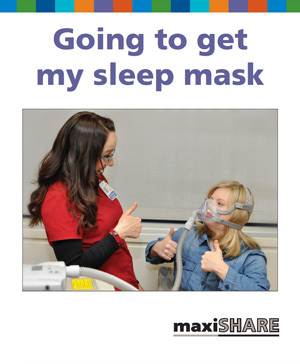 The Down Syndrome Clinic has developed this booklet to help prepare individuals with Down syndrome for CPAP use. This book uses pictures to help patients understand the purpose of the mask and why it will help them. Preparing them ahead of time can help them know what to expect, reduce anxiety, and improve compliance with using a mask. Click to download this book.